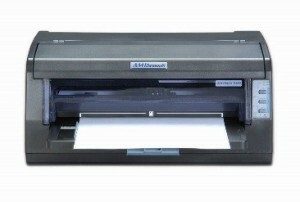 US Auto Sales: an example showing that if you’ve been using either a 9-pin or 24-pin printer and are looking for a versatile alternative with high quality printing and paper handling, the new Documax 5380 referenced below or the high-end ACCEL 7450 already used in many other dealerships, can be customized to specifically what you’re looking for. US Auto Sales, Inc. was founded in 1992 and today has 17 locations in Georgia and South Carolina. With over 12,000 customers and 1200 vehicles*, and extending credit while handling all of the financing themselves, there is a lot of paperwork to be completed when a sale is finalized. Each of the locations uses title reassignment forms when certified pre-owned vehicles are purchased. In the past, team members would have the customer sign a blank form and then the Title Department would handwrite the rest of the title reassignment form. The team at US Auto Sales was looking for a better solution that would allow for a multi-part form to be printed out with specific customer and car information included that the customer would then sign from there, resulting in the requisite copies that need to go to all the appropriate parties: customer, US Auto, the state, etc. This would give a more professional look to the title reassignment form and also would save the Title Department and sales team valuable time when completing the deal. Jeff Hintz who is the IT/Facilities Coordinator for US Auto Sales, began to look at options and found AMT Datasouth printers which are known for emulations that allow them to read data streams from numerous different types of existing applications – making transitioning printers easy and straightforward. In this case, the firmware would read data from an existing 9 pin Oki application. The technical team at AMT Datasouth analyzed a data capture provided by US Auto Sales and then customized the firmware on the 24 pin Documax 5380 to meet the specific data print requirements for US Auto Sales. This resulted in the six part title reassignment forms being printed exactly as they needed – a standardized, professional looking (and now high resolution) form every time. The 5380 is an ideal printer for consistent cut sheet and tractor-fed forms handling, this impact printer handles the six part title reassignment form easily. The 24-pin printhead produces high quality prints but requires only minimal desktop space. The zero tear-off design of the 5380 means that forms are not wasted and the ease of use for both the control panel and ribbon replacement, allows team members to stay focused on job one – the customer. And since the 5380 is relatively inexpensive, it meant the new printing solution could be deployed at all 17 locations – allowing for standardization and quality throughout the organization. When it was time for implementation, AMT Datasouth’s US-based technical team worked with Jeff to test the new printers and the emulation to make sure the title reassignment forms came out exactly as desired. This included the initial setup as well as testing. This personal approach allowed Jeff to be assured that installation was successful at all locations. So now that the new solution is up and running, what do the end-users think? “A big benefit that I hear from the sales managers, is that being able to easily print the title reassignment forms gives a nice professional touch to the customer experience. Whereas before, they would have the customer sign a blank form, then the Title Department would have to fill the rest out.” – Jeff Hintz.